Oregon's 4th annual Zwickelmania is in the books and I think it's safe to say the event's appeal was unsurpassed. Beer fans flocked to breweries around the state to celebrate the good health of the craft beer scene. I made four stops on my Saturday travels and each destination was buzzing. The growing success of this event brings up a couple of questions. First, who came up with the idea in the first place and what's it all about? Second, and perhaps more importantly, what's a zwickel? 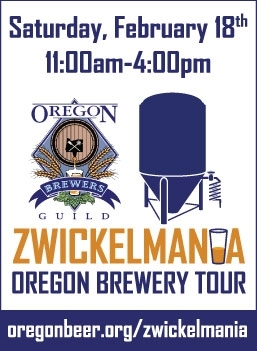 As the above poster indicates, Zwickelmania is the invention of the Oregon Brewers Guild. The mission of the Guild is to promote craft beer throughout the state. 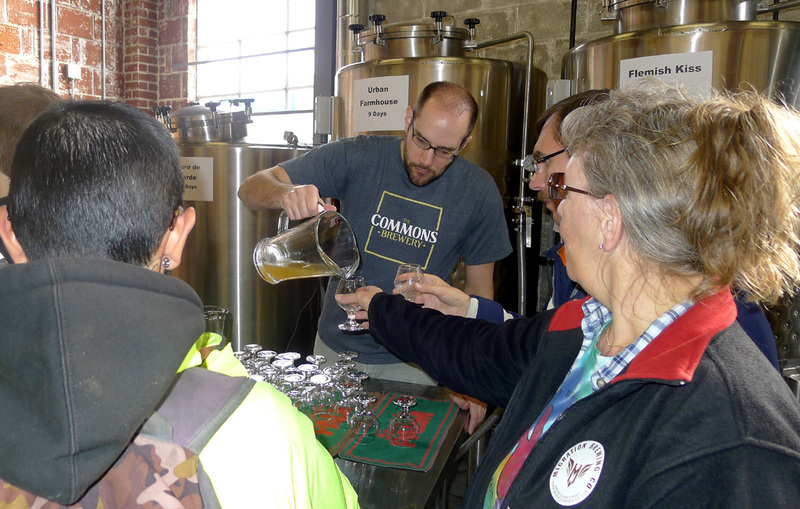 Zwickelmania does that by opening breweries statewide for tours and tastings. Did I mention this is a free event? Alrighty then. Moving on the the question of the zwickel. We owe a lot to the Germans when it comes to brewing and bier. The term Zwickelbier once described unfinished beer taken from a barrel via a special siphon called a Zwickelhahn. So there's your zwickel reference. Today, Zwickelbier is commercially available in Germany. There's further explanation here. And so, Zwickelmania features breweries showing people around and often providing beer samples directly out of fermentation tanks or barrels.Along the way, beer fans have the chance to rub elbows with brewers and other beer industry folks. Win vs win! There's a lengthy list of breweries and what they were doing here. I want to mention the tour aspect. There was a line out the door at Widmer, so I didn't stop there. It's on my list of places to tour and I'll get to it. But let's face it, the vast majority of Oregon breweries are small enough that a tour basically amounts to entering the brewhouse. A few descriptive words later and you get it. Such is certainly the case at The Commons Brewery. It was my main stop on Saturday. This place is quite small. The brewery and tasting room are mashed together. An official tour isn't really needed. Anyway, Mike Wright was toiling away at the bar while the other guys poured fresh beer tasters. The space was crowded, but the ambiance was buzzing and pleasant. I suspect that was a common theme. Hats off to the Oregon Brewers Guild and all the breweries who participate in Zwickelmania. What a great promotional gig! I suppose the biggest downside to this event is there will surely be calls to expand it. I'm not sure that can or will happen, but it's a nice example of what success can do. I suspect all states where craft beer is flowing have or soon will have a version of Zwickelmania. Thanks for the update, Pete. We were in Olympia for the weekend, but Zwickelmania sounds great. Hopefully next year.